Planet of the Apes is by no means an average film. Although we may be familiar with it now, it contains images which are frankly quite shocking on an initial viewing: clothed apes walking upright and talking, intelligent masters treating the inferior humans as we would treat animals or slaves, the world strangely turned on its head, and that final image in the last minutes of the film. Against this background, you don't want an everyday soundtrack, but one that is equally striking to complement the movie. Jerry Goldsmith did not disappoint in this department, but crafted a score reminiscent of modernist trends in classical music, and wholly original in the world of film. The impressionistic effect is that this music has reverted to some primitive basic form, even more primeval than Stravisky's Rite of Spring. The Main Title track immediately sets the tone of the whole score with low piano notes and short woodwind fragments over a percussive punctuation that avoids any resemblance to a regular beat. Then the Crash Landing track, after some initial loud noises, moves the music into a more tentative mode as the astronauts wonder where they have landed and start to explore. Rather than give a complete breakdown of all the tracks, this review aims to provide a flavour of what to expect. Much of the music seems to be raw and formless, although closer inspection does detect repeating motifs and sounds. Those sounds are in part made by a conventional orchestra, but using the instruments in unusual ways, whether it is the string section using the wood side of the bow, or the flutes using a "flutter-tongue" technique, some bending or sliding of notes, or wind instruments being blown through without the benefit of the mouthpiece. Some of the percussion sounds are unidentifiable, but the upturned metal bowls are there as mentioned in the review of Jerry Goldsmith's 70th birthday concert. You can also hear what might be ape noises in Track 10, and strange hunting horn calls in track 7. 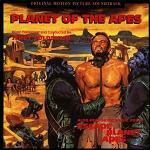 The last track on the CD is a suite from "Escape from the Planet of the Apes". Following the immediate sequel "Beneath the Planet of the Apes" (scored by Leonard Rosenman) which retained a little of the shock-value of the original, by the 3rd film in the series the material was becoming a little tired, forgetting satire entirely for straightforward story-telling with a little comedy thrown in. For this 3rd film, Goldsmith took the main theme of the original and jazzed it up in pop music fashion with guitars, synths and drum kit. This smacks of the "remix" trend but is quite catchy, and certainly demonstrates that there is thematic material in the original however hidden this might be on a first listening. Although some tracks from the movie had been released previously, this album contains the full soundtrack to "Planet of the Apes" including many tracks marked as previously unreleased, either in whole or in part. Care and attention in the album's production are evident in the programme notes booklet containing many photographs and the monocrome picture on the CD itself. More information about the album can be found at: Amazon.co.uk in the UK, or Amazon.com in the US. One other related item to look out for is the 35th Anniversary Edition DVD which has loads of extras including a commentary by composer Jerry Goldsmith. The Region 1 DVD is available from Amazon.com and the Region 2 DVD from Amazon.co.uk (see the covers reproduced here).